After getting service done for my rig, the car and the generator, all in one day, I was free to leave Albuquerque and head for Elephant Butte. While the weather forecast the night before had mentioned that there might be storms to the south the next day, the weather looked clear. Balloons from the Balloon Fiesta were up. I headed south. Within 50 miles, I had massive, intense-looking clouds to my right, charcoal skies in my rear view mirror, a few towering cumulus formations well to my left, and mostly clear skies in front of me. I was fighting some fairly heavy wind gusts. I kept thinking I would like to stop and grab a few shots of those skies with the camera and my fisheye lens, but the sky behind was so intimidating that I did not want to delay heading for that clear weather. I pushed on. By the time I reached Elephant Butte, I had been in some spotty but intense rainfall, some heavy gusting winds, and I was surrounded by dark skies. I pulled onto the point, put down my levelers and hunkered down. 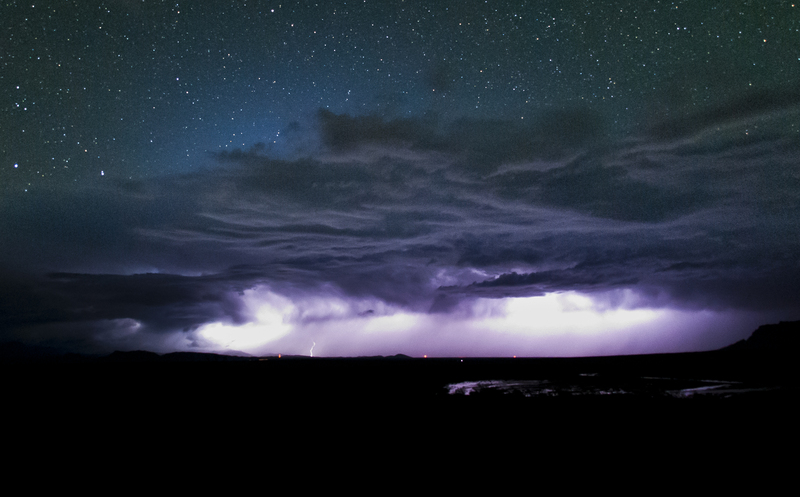 The storm hit fairly hard, with wind and rain, and lightning flashes in all directions. About an hour later, it was dark out, but the rain had stopped. I could see distant lightning flashes outside the windows. I grabbed the camera and tripod. The storm had passed. Stars were visible overhead. To the north, east, and south, however, there were still some massive clouds. They were being backlit by lightning. I rarely saw a lightning bolt, just the light from them in the clouds. My posts here usually include several photos. To be complete, I should have had the clouds as they built all around me in the late afternoon, then those massive towers being lit by the setting sun, finishing with this shot of the departing storm. Sorry – this time there is only one shot, but it is a sweet one.